In 2014, the owners of rooftop bar Perch opened Mrs. Fish in the basement of the Pershing Square Building, an office tower built in 1924 by architect duo Curlett and Beelman. Notable for its 5,500-gallon fish tank, the subterranean supper club spent those first years of its life as a live music venue. Now, Mrs. Fish has a whole new look, pivoting to a modern Japanese restaurant that puts sushi, contemporary art, and whisky at the forefront. According to Director of Operations Alex Reznik, Mrs. Fish’s “ownership”—the owner keeps their identity an enigma—was inspired by travels throughout Japan, during which they personally purchased each piece of art that now hangs in the restaurant. To accomplish this aim the space is broken up into multiple environments. Those familiar with the old Mrs. Fish will recognize the suspended saltwater tank and the black and white checkered floor. 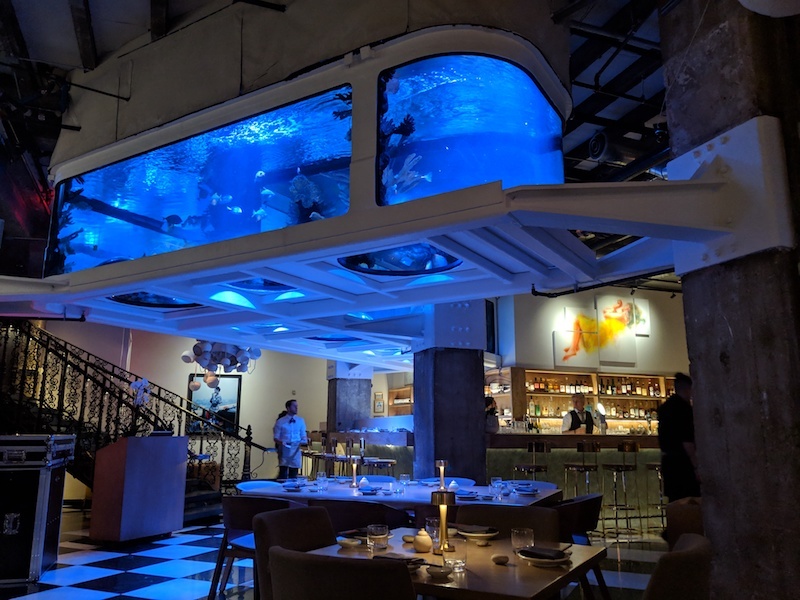 The main floor dining room has “more of an open vibe where you really get to feel the 30-foot high ceilings and look at the fish tank,” Reznik explained. On the upstairs mezzanine, a five-seat omakase bar allows an intimate dining experience for adventurous palates. Nearby, a cozy lounge with leather couches and patterned rugs offers a curated selection of over 60 Japanese whiskies. The lighting throughout is soft and blue-hued, but spotlights shine on the artwork and each table has its own small lamp (ideal, perhaps, for those who must photograph their meals). There’s plenty of sushi on the menu, the fish shipped in from Tokyo. 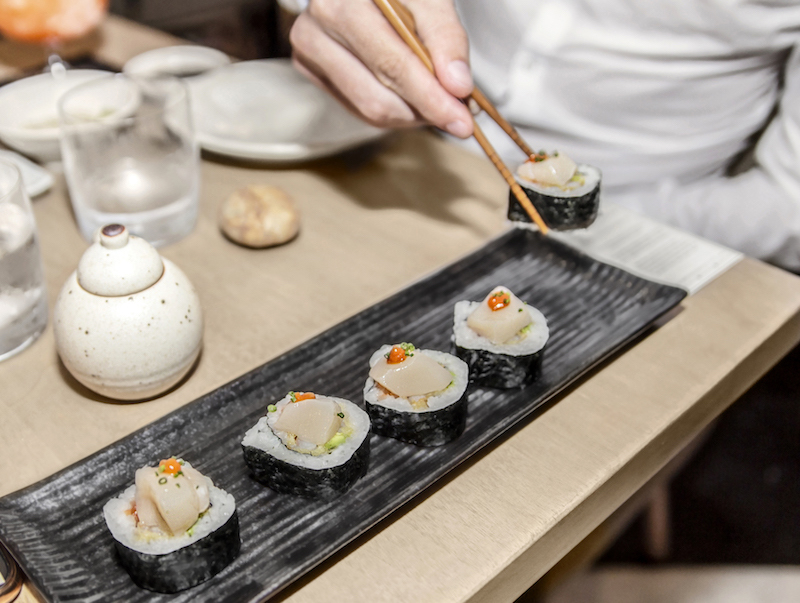 Despite the long flight, the fish tastes remarkably fresh, especially when presented in the sushi and nigiri or dishes like the smoky albacore warayaki. Other menu items include a rich uni pasta made with uni sourced from Japan and locally sourced lobster and topped with bonito flakes, and the Japanese Mountain Yams, which are fried until they’re crispy on the outside and soft in the middle, then covered in a sweet soy glaze. 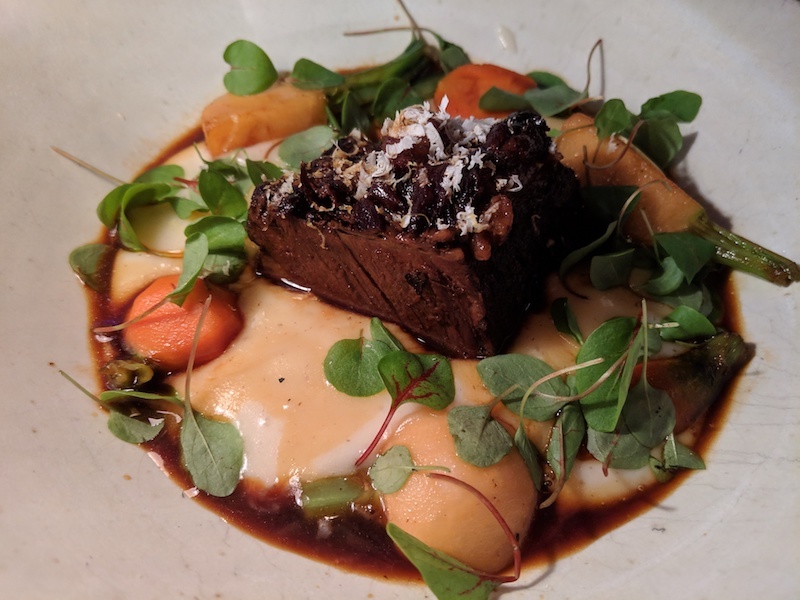 Meatier options include steaks, a tender short rib in a sunchoke puree, and a variety of skewers, including pork belly, Jidori chicken, and rock shrimp tempura. For dessert, we’d suggest a slice of their creamy yuzu cheesecake. The bar program leans heavy on the aforementioned whisky, which you can have on its own or in a highball, a simple cocktail of whisky and club soda that’s incredibly popular in Japan. According to Mic’s Hidden Histories series, the highball was likely invented in the U.S. and has been around in Japan since the 1920s. But it really picked up steam mid-century when Suntory founder Shinjiro Torii opened Torys, a chain of bars that featured the highball on the menu. Suntory also created their own machine that produces a highly carbonated soda for what is supposedly the perfect highball. Mrs. Fish is the proud owner of one such machine. If you aren’t in the mood for whisky, they also have beer, wine, sake, and cocktails (including three non-alcoholic concoctions). The art is worth a walk around before or after your meal. Near the entrance, visitors can glimpse a self-portrait from Satoko Nachi. 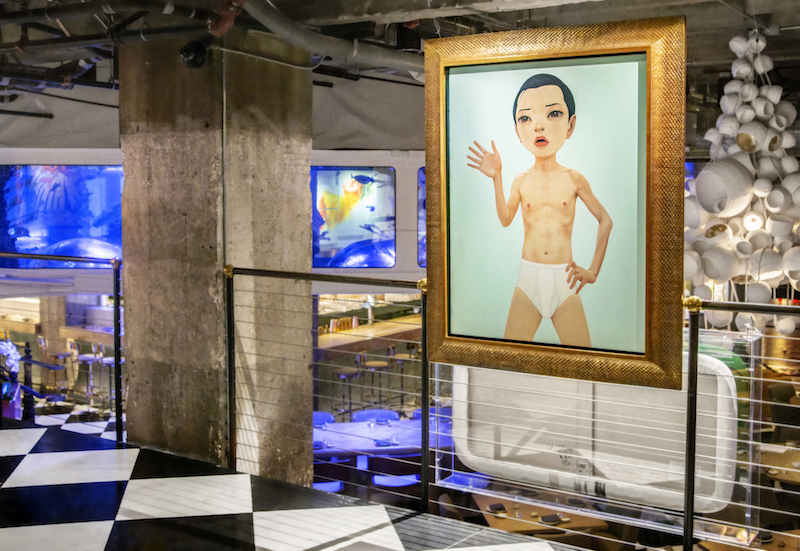 Upstairs, Hideaki Kawashima’s “Speech” depicts a young man pontificating while wearing nothing but a pair of underwear. A stunning image from Tomomi Nitta features a woman in a yellow dress, cut into four sections; it hangs behind the main bar. “Candy Girl” features a blond, blue-eyed woman reminiscent of Alice in Wonderland gazing upwards. It’s a piece from Yoshitaka Amano, who worked on Neil Gaiman’s The Sandman: Dream Hunters, anime Vampire Hunter D: Bloodlust, and several early Final Fantasy games. Shohei Otomo, son of Akira creator Katsuhiro Otomo, offers a monochrome drawing of a fully tattooed woman so realistic it looks like a photograph at first glance. There are also several pieces by artist Ai Kato, otherwise known as Ai Madonna, including a series of anime portraits and scenes. For those on a budget, Mrs. Fish offers nomikai Tuesday through Friday from 5 to 7 p.m. In Japan, nomikai (“drinking party”) is when co-workers of all levels come together to share drinks together after work. The menu features a selection of $5 drinks, including that Suntory highball, and $6 bites. Mrs. Fish is located at 448 S. Hill St. in downtown Los Angeles. Open Tues.-Thurs., 5 to 11 p.m.; Friday, 5 p.m. to 1:15 a.m., and Saturday, 5:30 p.m. to 1:15 a.m.